What makes a movie or a novel classic? It is a question everybody asks but I am not sure if anybody wants to know the answer. I for one, don’t need such labels for things I enjoy. But I dare say, Ee. Ma. Yau is going to be considered as a classic in the years to come. There are so many good things about the movie. I was talking to a wedding photographer few weeks before and I realized the number of people who make their living out of the decision of two people to live together. The textile shops, the Prohits, The makeup artists, the photographers, the caterers. It is a good thing that a marriage brings livelihood for a lot of people and it is one of the best ways to have the money flowing. Trouble starts when the decision of these two people starts getting affected by the availability or unavailability of the above-said services. The hall is not available on our fixed date, can we postpone our marriage to next auspicious day? The photographer is not ready to come to the destination wedding, can we look somewhere closer? This is when a holy, emotional institution becomes a business. Ee. Maa. Yau talks about that. At the heart of the story is a son’s promise to his father to give him a grand send off. Most of us don’t talk about this to our parents. Most of the parents wouldn’t bring this up to their children too. At the end of the day, we do things that may or may not be necessary for the deceased to rest in peace. There is a death and the whole community except the son and son’s friend tries to take advantage of it, show off their power and ego and make money out of the misery of the poor man. 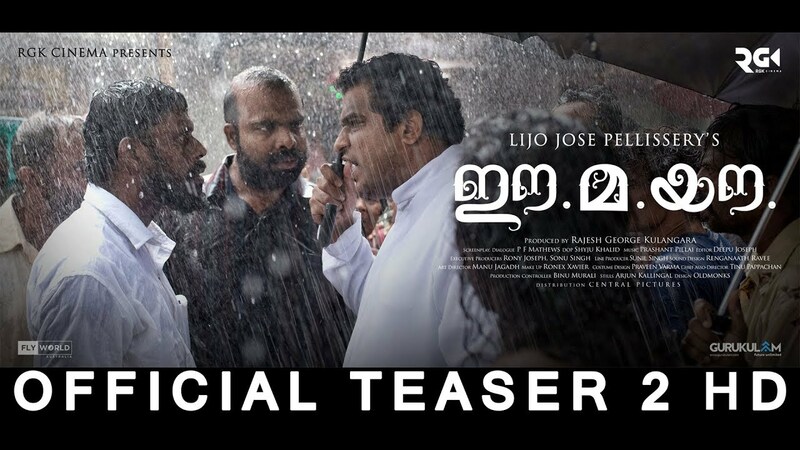 This straightforward story told by Mr. Mathews and Lijo Jose goes into the psyche of each and every character. They honestly wanted to know and show us the characters as they were. How many times have we seen a villain give entry with a dangerous-sounding music or hero given entry with a grand music? I have always wondered what does that music director wanted to tell us? Is he giving us a cue that we should understand the character by the music being played? Is it because of the inability of the actor or director to establish the character in a first scene or lazy to let me decide over a period of time? In Ee. Ma. Yau, right at the interval block, Reverend Father walks in the beach with just a torch in his hand towards the house where he thinks there was a foul play in the death. There is no background music but we hear the raging waves crashing on the shore, reflecting the father’s mind. This kind of honesty towards each and every character makes the film stand apart. At one point in time, we don’t know where the writing goes and direction comes inside. In a particular scene, the hero’s friend walks into a police station. I was expecting a busy police writer, few lockup cases and somebody asking bribe. But the police station is hosting a farewell to one of their constables. And we see the Circle Inspector talking about the constable, equating him to his father and how he is finding it very hard to let go. The hero’s wife is shown adding something to the dish he is about to eat to keep him home. She has a good relationship with hero’s mother and sister. When hero decides to print a condolence poster, the friend asks her qualification that should come after her name in the poster. “It isn’t important,” the hero says. It didn’t quite hit me when I watched the scene but when I think about it, I can see that all it matters for the lead character out of his wife is how she cooks and keeps her home rather than her educational qualifications. Such commentaries are aplenty in the movie, but it doesn’t take us off from the primary focus even for a second. Lijo Jose had always been vocal about the power the priests hold in Christian society. This movie is no different and Dileesh Pothan was wonderful as Detective novel loving pastor. I felt only because of his nuances in acting, he extracts the same from his crew. There are no words to praise Vinayakan in the movie. His appearance immediately makes us think that he is one of the members in the small fishermen colony slowly grows to be a responsible friend who takes care of everything when his friend, still mourning his father, taking irrational decisions. His reaction to each and every occurrence and his final breakdown during the rain made us feel for that person. Personally, I feel that his character was not given closure. But if we extend the movie, the character Aiyappan would still be friends with the lead character and help him in any way he could. The setting is everything in the movie. Right from the breeze to crashing waves and rain, I got familiar with it in a very short time. When the lead brings a long, costly casket to home, I wondered how the auto will manage to reach the front of the house. There is a scorned drunkard, there is a lover who cannot keep his hands off his lady love even when she is mourning her father’s death. There is a bike riding head nurse who lords over all in the house to give a certificate, there is a representation of life and death playing cards amidst all this chaos which makes us wonder Ee. Ma. Yau (Eesha, Mary, Ousuppe translated to RIP) is just a final cruel joke that life plays on us.